T'ai chi is an ancient Chinese exercise with movements that originate in martial arts practice. While used as a type of self-defense in its most advanced form, t'ai chi is practiced widely for its health and relaxation benefits. Those in search of well being and a way to combat stress have made what has also been called “Chinese shadow boxing” one of the most popular low-intensity workouts around the world. The concept of t'ai chi, or the “supreme ultimate,” is based on the Taoist philosophy of yin and yang, or the attraction of opposites. Yin and yang combine opposing but complementary forces to create harmony in nature. By using t'ai chi, a person can bring this principle of harmony into their own life. A disturbance in the flow of ch'i (qi), or the life force, is what traditional Chinese medicine regards as the cause of all diseases in the body. By enhancing the flow of ch'i, practitioners of t'ai chi believe that the exercise can promote physical health. Students of t'ai chi also learn how to use the exercise in the form of meditation and mental exercise by understanding how to center and focus their cerebral powers. In the traditional Chinese understanding of health and well-being, t'ai chi is not regarded as a self-sufficient compartment of a person's life, as physical exercise often is viewed by Westerners. Instead, t'ai chi is considered part of an overall way of healthful living that includes massage, proper diet, meditation, and herbal medicines as needed. The origins of t'ai chi are rooted deep in the martial arts and Chinese folklore, causing its exact beginnings to be based on speculation. The much-disputed founder of t'ai chi is Zhang San-feng (Chang San-feng), a Daoist (Taoist) monk of the Wu Tang Monastery, who, according to records from the Ming-shih (the official records of the Ming dynasty), lived sometime during the period from 1391–1459. Legend states that Zhang happened upon a fight between a snake and a crane, and, impressed with how the snake became victorious over the bird through relaxed, evasive movements and quick counterstrikes, he created a fighting form that copied the snake’s strongest attributes. With his experience in the martial arts, Zhang combined strength, balance, flexibility, and speed to bring about the earliest form of t'ai chi. 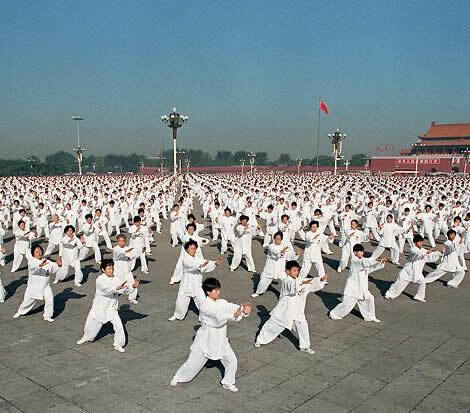 Historians also link Zhang to joining yin-yang from Taoism and “internal” aspects together into his exercises. This feeling of inner happiness, or as a renowned engineering physicist and t’ai chi master, Dr. Martin Lee, states in his book The Healing Art of t’ai Chi, of becoming one with nature,” remains a primary goal for those who practice t’ai chi. Although its ancient beginnings started as a martial art, t’ai chi was modified in the 1930s to the relaxing low-intensity exercise that continues to have the potential to be transformed into a form of self-defense, similar to karate or kung-fu. The art of t'ai chi is many things to the many who practice it. To some, it is a stretching exercise that incorporates a deep-breathing program. To others, it is a martial art—and beyond this, it is often used as a dance or to accompany prayer. While the ways in which it is used may vary, one of the main benefits for those who practice it remains universal—t'ai chi promotes good health. Lee contends that stress is the culprit of much of the pain and suffering that are a part of everyday life. The growing evidence that stress contributes to devastating physical and mental ailments has led Lee to teach a systematic, effective, and manageable way to restore both body and mind to a natural stress-free state. As of 1996, Lee had been teaching t'ai chi for 20 years to help his students with physical ailments that have been caused by stress. He believes that illness can be overcome through understanding the body as a mental and physical system, which is accomplished through t'ai chi. While the martial arts offer very vigorous physical workouts and often result in injuries, the practice of t'ai chi is a good alternative to these sports without over-straining the body. Those with bad backs have also found t'ai chi to ease their discomfort. Zhang, the notable originator of t'ai chi, created a combination of movements and beliefs that led to the formation of the fundamental “Thirteen Postures” of his art. Over time, these primary actions have transformed into soft, slow, relaxed movements, leading to a series of movements known as the form. Several techniques linked together create a form. Proper posture is a key element when practicing t’ai chi to maintain balance. All of the movements used throughout the exercise are relaxed with the back straight and the head up. Just as the movements of t'ai chi have evolved, so have the various styles or schools of the art. As the form has grown and developed, the difference in style along with the different emphasis from a variety of teachers has as well. A majority of the different schools or styles of t'ai chi have been given their founder's surname. Many of the most commonly used groupings of forms are based on the Yang style of t'ai chi developed by Yang Pan-Hou (1837–1892). Each of the forms has a name, such as “Carry the Tiger to the Mountain,” and as the progression is made throughout the many forms, the participant ends the exercise almost standing on one leg. While most forms, like “Wind Blows Lotus Leaves,” has just one movement or part, others, like “Work the Shuttle in the Clouds,” have as many as four. While the form is typically practiced individually, the movement called “Pushing Hands” is a sequence practiced by two people together. Masters of t'ai chi recommend that those who practice the art begin each session by doing a warm-up of gentle rotation exercises for the joints and gentle stretching exercises for the muscles and tendons. Some other suggestions to follow before beginning the exercise include: gaining a sense of body orientation; relaxation of every part of the body; maintaining smooth and regular breathing; gaining attention or feeling; being mindful of each movement; maintaining proper posture; and moving at the same pace throughout each movement. The main requirement for a successful form of t'ai chi is to feel completely comfortable while performing all of the movements. Although t'ai chi is not physically demanding, it requires close attention to one's posture. Those who want to practice the exercise should notify their physician before beginning. The physician will know whether the person is taking medications that might interfere with balance, or has a condition that could make a series of t’ai chi movements unwise to attempt. While the reasons why t'ai chi is practiced vary, research has uncovered several reasons why it may help many medical conditions. For example, people with rheumatoid arthritis (RA) are encouraged to practice t'ai chi for its graceful slow sweeping movements. Its ability to combine stretching and range-of-motion exercises with relaxation techniques work well to relieve the stiffness and weakness in the joints of RA patients. An ongoing research program at Stanford University in California is evaluating the beneficial effects of t'ai chi on patients with fibromyalgia. A study of fibromyalgia patients in Georgia reported in 2003 that t'ai chi brought about significant improvement in the patients’ control of their symptoms. T'ai chi has also been shown to benefit patients with osteoarthritis (OA). A group of Korean researchers found that women diagnosed with OA showed significant improvement in their balance and abdominal muscle strength after a 12-week program of Sun-style t'ai chi. In 1999, investigators from Johns Hopkins University in Baltimore, Maryland, studied the effects of t’ai chi on patients with elevated blood pressure. Sixty-two sedentary adults with high-normal blood pressure or stage I hypertension who were aged 60 or older began a 12-week aerobic program or a light-intensity t'ai chi program. The exercise sessions both consisted of 30-minute sessions, four days a week. The study revealed that while the aerobics did lower the systolic blood pressure of participants, the t'ai chi group systolic level was also lowered by an average of seven points—only a point less than the aerobics group. Interestingly, t’ai chi hardly raises the heart rate while still having the same effects as an intense aerobics class. In addition to lowering blood pressure, research suggests that t’ai chi improves heart and lung function. The exercise is linked to reducing the body’s level of a stress hormone called cortisol, and to the overall effect of higher confidence for those who practice it. As a complementary therapy, t'ai chi is also found to enhance the mainstream medical care of cancer patients who use the exercise to help control their symptoms and improve their quality of life. Physical therapists investigated the effects of t'ai chi among 20 patients during their recovery from coronary artery bypass surgery. The patients were placed into either the t'ai chi group or an unsupervised control group. The t'ai chi group performed classical Yang exercises each morning for one year, while the control group walked three times a week for 50 minutes each session. 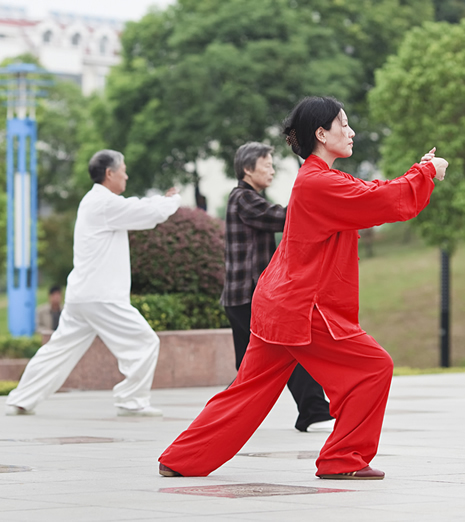 In 1999, the study reported that after one year of training, the t'ai chi group showed significant improvement in their cardiorespiratory function and their work rate, but the unsupervised control group displayed only a slight decrease in both areas. T'ai chi has also shown to keep people from falling something that happens to one in three people over age 65 each year. Researchers from Emory University in Atlanta, Georgia, had dozens of men and women in their 70s and older learn the graceful movements of t'ai chi. The study discovered that those who learned to perform t'ai chi were almost 50% less likely to suffer falls within a given time frame than subjects who simply received feedback from a computer screen on how much they swayed as they stood. Those who suffer falls experience greater declines in everyday activities than those who do not fall, and are also at a greater risk of requiring placement in a nursing home or other type of assisted living. Researchers recommend the use of t'ai chi for its ability to help people raise their consciousness of how their bodies are moving in the environment around them. By raising awareness of how the body moves, people can focus on their relationship to their physical environment and situations they encounter everyday. In addition to studying the cardiovascular and rangeof-motion benefits of t’ai chi, researchers are also investigating its positive effects on the immune system. A team of scientists in California reported in 2003 that t'ai chi boosts the resistance of older people to the shingles virus— a virus that is both more common and more severe in the elderly. Some research done in the United States focuses on the emotional and psychological benefits of t'ai chi. One recently discovered advantage of t'ai chi is its ability to hold people's interest longer than many other forms of exercise. One study in Oregon found that only 20% of people enrolled in a six-month t’ai chi program dropped out before the end, compared to an average of 55% for other forms of exercise. With regard to depression,a study of college students found that those who were taking t'ai chi classes had a lower rate of depression than students enrolled in other fitness programs. One interesting recent change in the acceptance of t'ai chi in the United States and Canada is its growing popularity among men. In the 1970s and 1980s, many adult males regarded t’ai chi as a form of exercise that was not challenging enough for “real men.” Since the late 1990s, however, more men have begun practicing t’ai chi in order to relieve stress or as a form of cross-training with another sport. While the additional benefits of t'ai chi remain to be studied in the United States, it continues to be widely practiced in this and other Western countries. The ancient art maintains its prominence in China, where many people incorporate it into their daily routines at sunrise. Masters of t'ai chi are trained extensively in the various forms of the art by grandmasters who are extremely skillful of the exercise and its origins. For those who wish to learn t'ai chi from a master, classes are taught throughout the world in health clubs, community centers, senior citizen centers, and official t'ai chi schools. Before entering a class, the instructor's credentials should be reviewed, and they should be questioned about the form of t'ai chi they teach. Some of the more rigorous forms of the art may be too intense for older people, or for those who are not confident of their balance. Participants are encouraged to get a physician's approval before beginning any t'ai chi program. There is no age limitation for those who learn t'ai chi, and there is no special equipment needed for the exercise. Participants are encouraged to wear loose clothing and soft shoes.